Psychopomp | Taking you someplace that's…else. 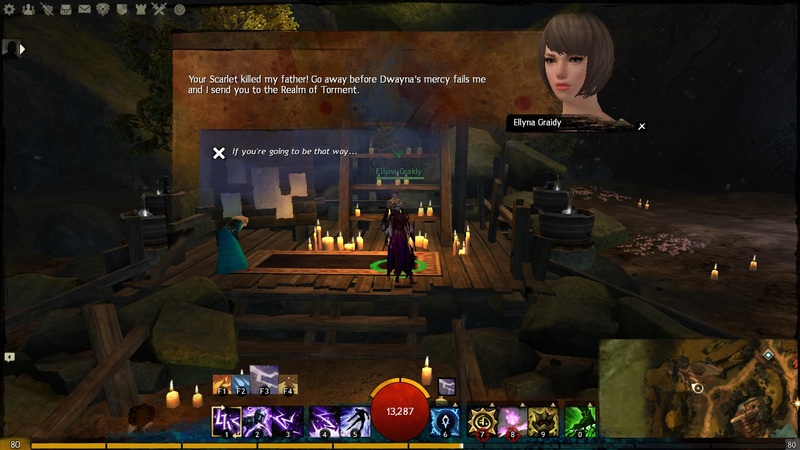 So, do you remember way back when ArenaNet people talked about how quest descriptions that are long blocks of text, which players have to sit and read before they can get to the action and will probably just skip instead, were not the way to go? Because apparently the current Living Story team doesn’t. I am spending way too much time clicking through scripted dialogue with NPCs which, while interesting from a lore perspective, is a passive info-dump for which I just sit, and click, and sit, and click. If I’m not doing that, I’m standing around while the NPCs talk around me. I can only imagine how people who aren’t interested in the minutiae of lore find this. What happened to action which happens around you, people who talk on the way while you’re doing things? I get that there’s a lot of information to provide for things to make sense, but must we do it through compulsory segments of clicking on interact icons to read item descriptions around a room before we can move on? Fandom grows up around all sorts of things. I have long argued that ‘geek’ (or whichever similar term you prefer) is a label that can be applied more widely than it is – it’s just that sports geeks, or fashion geeks, are somehow more accepted, even if some of us still don’t understand how you can be that into it. Still, it’s quite common for people to look at the work and fervour of devoted fandoms and think – all this, over that? It’s ‘just’ a comic. ‘Just’ a tv show. It’s ‘not real’. People outside a fandom are often startled, even made uncomfortable, by the depths of people’s investment in these frivolous things. Leaving aside the “but it’s not real” argument for now (because oh, is that a post in itself), I’ve been thinking recently about the way that talented participants in a fandom can extrapolate from an original work, interpreting it and re-presenting it through their own emotions and their understanding of what they love. This has been driven home to me by works of the Homestuck fandom. Although the work itself ranges from simple, cartoonish art to rather more epic cinematics, the fandom takes it to whole new levels. What I’m interested in right now is emotional depth. Fan works can be imbued with a fan’s feelings about the original source, their own relation to it and their interpretations, and this can add a whole lot that might not be initially appreciated if one reads/views the source alone. What kind of alchemy turns the mad, loud, painfully bright video linked above into this? Of course there’s more context. PhemieC‘s song above is also about the greater developments on either side of the psychedelic Trickster interlude – the angst and frustration and self-loathing that drive Jane beforehand, and the regret and awkward truths that follow in the wake of it. It captures the freedom of having no inhibitions while reminding us (as the original story does) that it’s not that simple; the apparent simplicity of this mode of being is poisonous. Everything in ‘Sweet’ comes from Homestuck, it’s not extrapolated particularly far from the original, and yet PhemieC’s song carries an emotional quality that the original doesn’t. It distils some of the six thousand or so pages that lead to this point in the story down to something that non-readers can understand, and conveys something that reading all of that did. Not to mention, it’s pretty and catchy, while Trickster Mode makes your head hurt just looking at it after a short while. I call this an alchemy because it really does turn one thing into another. The silly and light-hearted can become a vehicle for serious issues (as Homestuck itself does, overall) – or the serious and dark can become silly, as meme culture often transforms snippets from shows such as A Game of Thrones or Breaking Bad. In the movement from original work to fan work, the fans put in a little of themselves and their fandom, their relationship with the show or it’s characters (cf: shipping!). Some examples may be closer or further from the original intent (see again: shipping), but I find it fascinating how good fan art, music or fiction can convey how someone feels about what they’re a fan of – and in a way that other fans recognise and relate to themselves. Just a thing to think about. Also you should read Homestuck. The April Feature Pack update in Guild Wars 2 shook up a lot of things, providing some bonuses (free unidentified dyes, free skins for many who would otherwise not use their PvP gear) and some downsides (loss of freedom in transmuting gear below level 80, loss of anticipated traits at mid-levels) for characters already in existence at the time. Transition is always tough, though, and while problems with it are still significant, they’re one-time problem. I thought a fairer way to evaluate the various new systems that GW2 now has in place was to level a character from scratch, created after the update. So: this is Sefalie, sylvari ranger. The final feature to be previewed before next week’s big (very big) update has been announced, and they’re not kidding when they say it’s a major one. The very way that servers work is changing. Once again, I note that this addresses something I used to hear people complain about in the first year of the game, and rarely hear any more – but that’s not necessarily a reason to ignore it, especially since the megaserver system implements a solution I’ve heard players suggest in-game. There are things I don’t like about it, both for practical reasons and for reasons of principle. However, it’s one of those changes that has made more sense the more I think about it. In short: while accounts will still have home worlds, in actual play there will no longer be clear divisions between servers. 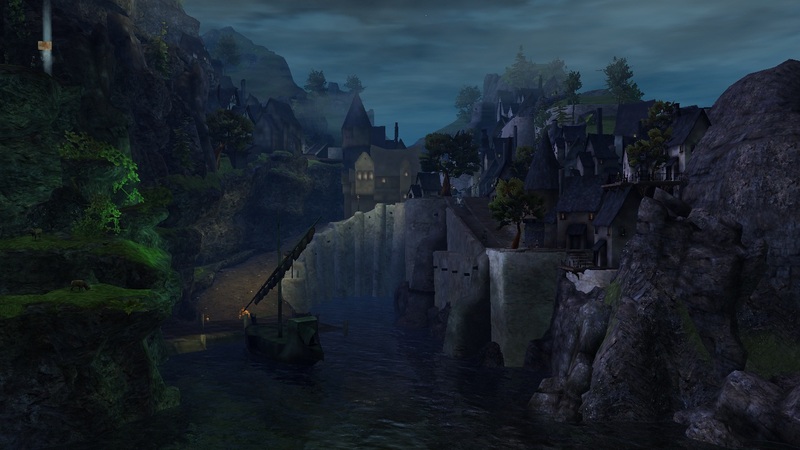 Once the megaserver system is fully rolled out (which will take a few months from the sound of it), players entering any zone will find it populated with people from a variety of home worlds, rather than a specific copy of that zone for their world alone. Coming back to Lion’s Arch in the wake of recent events was suitably touching. The new background music, called Lion’s Arch Lament and containing echoes of the more familiar ‘Sea of Sorrows’ piece, adds a tragic dignity to the sight of the city, almost completely empty and largely in ruins. After seeing it a bustling city and then a fiery battleground, the emptiness is actually quite striking, as well as the large pieces of Scarlet’s drill which lie embedded where they fell when the thing exploded over the harbour. It’s the little things, though, that I really appreciate sometimes. In Bloodtide Coast, a member of the Captain’s Council warned my sylvari elementalist that some refugees might be unkind to me, because they equated Scarlet with all sylvari. 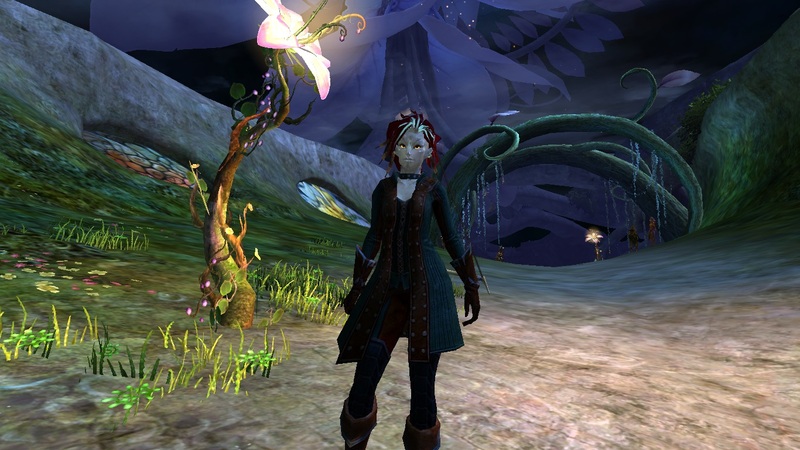 A refugee in Gendarran Fields assured me that whatever some people said, she knew we sylvari weren’t all like that. And in Lion’s Arch itself, at the site of a new graveyard created to hold the dead from the battles with Scarlet, a human woman took out her grief on me because I shared a race with a psychopath. These are the touches that make me smile, or even feel a little hurt, when I’m exploring the story ArenaNet’s staff are telling us. The latest preview of what’s to come in the April 15th feature pack focuses on structured PvP – but if you’re like me and usually figure this means it doesn’t apply to you, don’t turn away yet. 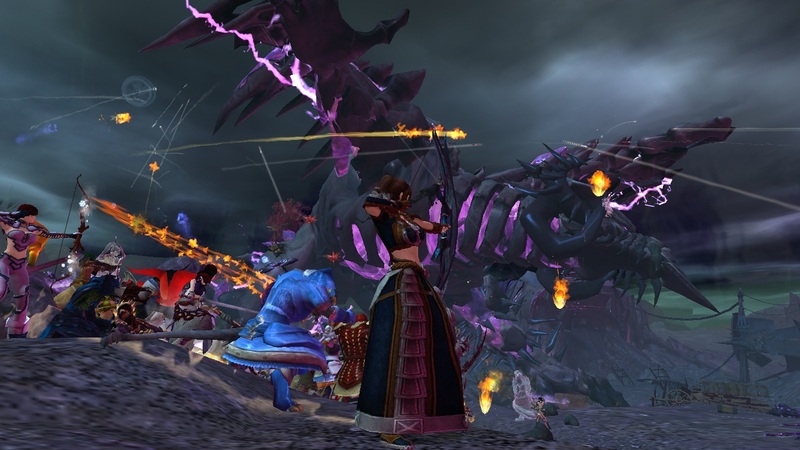 The theme of this update to PvP is integration: ArenaNet are looking to remove some of the distinctions which make sPvP its own self-contained game within a game, separated from PvE. Thankfully, none of this update makes it strictly necessary or even too strongly incentivised to participate in PvP play, but it does extend the philosophy that underlies a lot of WvW design (you should be able to entirely level a character and achieve most things through WvW alone if you want to) to structured PvP as well. 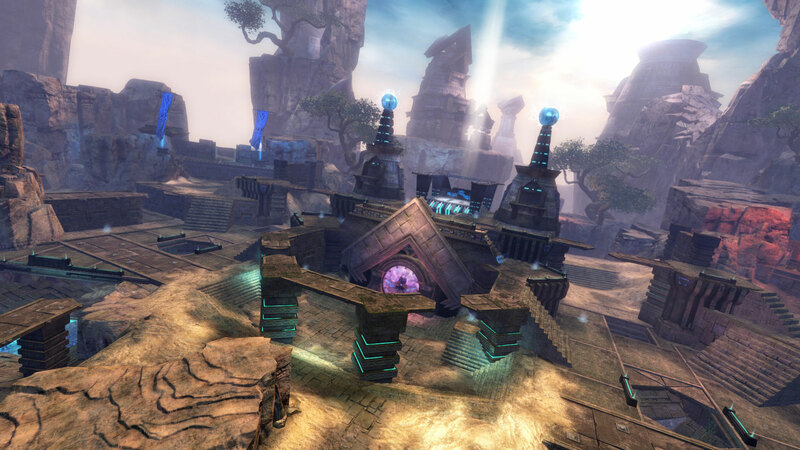 Continuing their coverage of the April 2014 Feature Pack, ArenaNet have released three smaller posts in two days: one on ‘social play‘, one indicating even more things shifting from character- to account-bound, and one announcing free armour repairs. Each of these covers some more basic features that don’t need as much elaboration as previous posts, and while not insignificant I think most of them will come as no surprise to those who’ve been following the releases closely – all of this fits along the same principles as what came before.